I love the Boxster Spyder in all its iterations. The 987 Spyder was a very focused and lovely lightweight machine with very few compromises. The 981 Spyder we drove back in 2015 was sublime, certainly ranked among the best Porsche road-going sports cars ever made. 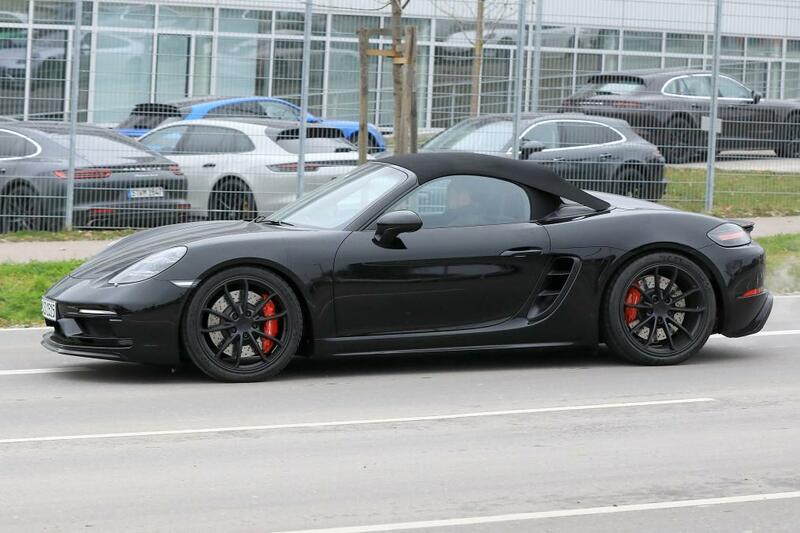 Thanks to this series of photographs taken near the Porsche factory gates in Stuttgart, we've now seen that Porsche is working on what appears to be a new 718-generation Boxster Spyder. We couldn't be more excited. The old Spyder model made use of a 911 Carrera S 3.8-liter flat six and produced 375 horsepower. The fact is, the only naturally aspirated flat-six engine Porsche still makes is the 4-liter found in the current GT3. Is it possible that the new Boxster Spyder will get this high-revving gem of an engine? AutoExpress seem to think so. I'm not so sure. We know that Porsche's GT department probably wouldn't consider a turbocharged engine for the GT3 (or the next generation GT4 they're allegedly working on), because Andreas Preuninger, head of GT car development at Porsche has been quoted as saying “Natural aspiration is one of our main USPs. At Motorsport, we think we can achieve throttle response and immediacy a little bit better with an atmospheric high-revving engine than any kind of turbo.” Porsche has made it clear in the past that the Boxster Spyder wasn't explicitly a GT program car, but because it shared development with the GT4, it certainly had that lineage. Is it possible that for the 718-generation the Boxster Spyder and GT4 will take a divergent tack? If these photographs had been a short video, we'd have audio evidence. I have a hard time believing that Porsche would equip their compliant roadster with a rip-roaring 4-liter. This is all just speculation, but I'm not convinced that Porsche will give the Boxster Spyder more than the 420 horsepower found in the current Carrera S. If this new Spyder is anything like the outgoing model, priced under $100K, the 4-liter doesn't make a lot of sense. That engine makes 500 horsepower. I can't see a sub-$100K super Boxster maiking 500 horsepower, and a 500 horsepower super Boxster would surely cost more than $100K. I'm more inclined to believe that the potential new 718 Cayman GT4 would get the 4-liter and a huge price bump, while the Boxster Spyder could possibly get a larger displacement version of the turbocharged flat-four with a healthy power bump over the current 718 Boxster GTS, which makes 365 horses as is. We won't know for certain until this Porsche is officially unveiled. Based on the photographs, it appears to be nearly showroom ready, and should be launching soon. We don't think Porsche would launch this at the LA Auto Show next week, instead saving that show for something perhaps more important to the brand's trajectory (watch this space), but it wouldn't be out of character to have two big unveils at the same show. Perhaps the Detroit show in January? In any case, we look forward to seeing what Porsche's new Uber Boxster is going to be.